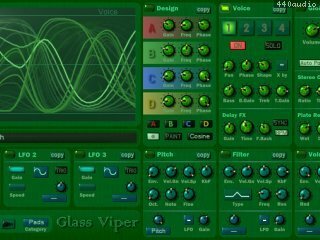 Glass Viper is a synthesizer with unique waveform shaping, that has a deep and natural sense of movement. Going beyond analogue simulation, into a truly organic sound, from simple old synths to grungy filthy basses, or delicate pianos to strange unnatural film effects. 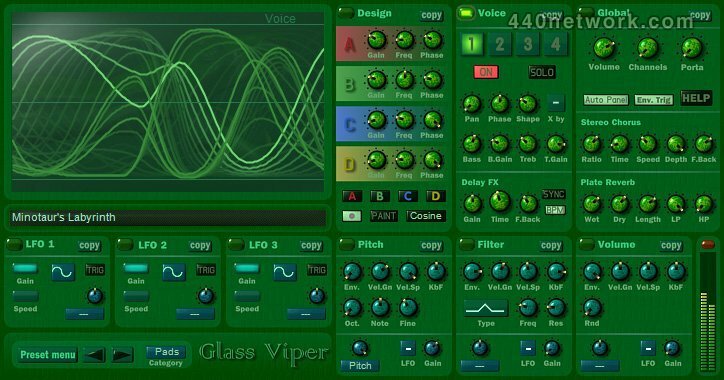 Instead of taking a sample or oscillator and applying just filters and FX techniques, Glass Viper bends the actual shape of its waveforms through a series of moving control points. Up to four of these swirling and changing sounds can be layered together to create a huge range of instruments. Glass Viper allows you to really shake things up with a deep, natural sense of movement. * 64 bit for Windows and Mac OSX. * Bank loading and saving. * Clearer user interface, with pixel fonts, higher contrasts, and larger display panel. * A wipe option for clearing all the presets to simple defaults. Useful for building banks from scratch. * Crash bugs, and silent start up problems fixed. * Brighter text labels, for readability. * Better menu preset loading, with manual sorting. * Copy and Paste fixes. * MIDI Pitch-bend and breath controller fix for Logic users. * Preset saving errors in Garage Band, fixed. * Pitch LFO small range problems, fixed. * Minor memory freeing issues on exit, cleaned up. * Glass Viper gets a new skin! * Note stealing gives back old notes - allowing for a better solo playing experience. PPC Mac VST editing animations fixed. Skimming through the presets, it looks like this simple interface can create complex and upfront sounds. Doesn't try and copy other synth sounds, so yes a very useful tool to add.